healthcare clinicians seeking management position in the healthcare industry or desiring to enhance their management skills. Students completing this program will also be prepared to continue the pursuit in the bachelor’s degree in Business Administration with Healthcare Scheme option. 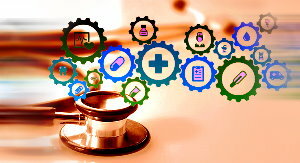 Students may be admitted to the AS in Healthcare Management program after they have completed General Education courses or be enrolled, concurrently, in General Education courses, which must be completed prior to completion of the AS in Healthcare Management program, and with a minimum G.P.A. attained must be of 2.0 or better. General Education courses are designed to give each student a breadth of experience in various academic disciplines. These learning experiences provide an introductory base to different fields of study and discuss how each disciple conducts its research, thus adding to general knowledge. GE courses are offered at community/city colleges. To meet the graduation unit requirements, students are required to complete 21 units in General Education Courses, 27 units in Business Foundation and Core Courses and 12 units in the Healthcare Management Scheme courses.